Squiggles – A Fun Pre-Writing Development App! Squiggles – is a fun, animated pre-writing and drawing app that will make you wiggle and giggle drawing squiggles or lines and more! This is sure to motivate students to engage in pre-writing tasks! Free and compatible with the iPad, this drawing app allows you to draw squiggles and shapes and lines on images on the page. After you draw and press Go, your drawings or squiggles become animated (in the drawing below the exhaust lines would “squiggle”). With a two different pallets of objects to squiggle on, different colors and drawing tools are offered to be creative with your drawings. Although the app encourages “squiggles”, I see many opportunities to model and draw geometric shapes, lines and details on the objects offered in the objects palette. Good for preschoolers working on pre-writing skills to primary aged students who are acquiring the ability to draw shapes, work on directionality or adding details to existing pictures. 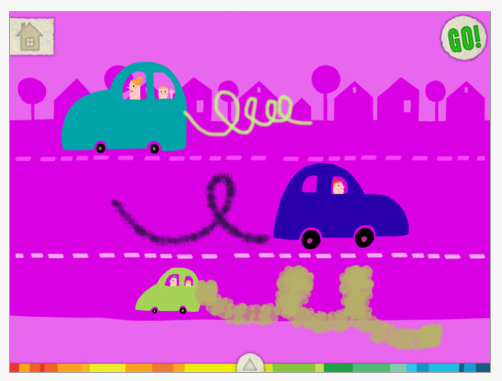 Squiggles app offers some fun, motivating drawing opportunities for preschool and primary aged students. 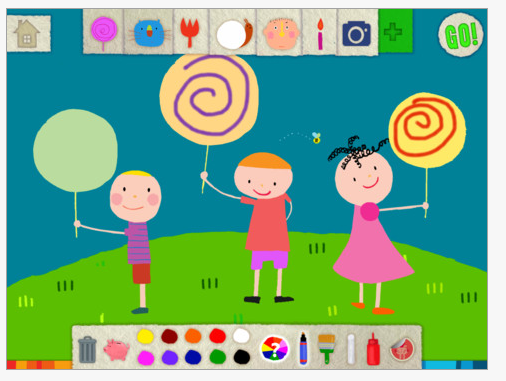 The tools offered also will allow therapists to work on visual motor skills within the app if you use your creativity. Kids will love this app! This is definitely an app I have added to my OT iTool Kit!! This entry was posted in App Reviews, Apps for OT's, Early Childhood, iPad, Occupational Therapy, Pre-writing, Special Needs, Uncategorized, Visual Motor and tagged App Review, Fine motor apps, iPad, occupational therapy, OT Apps, pre-writing, Visual motor apps. Bookmark the permalink. I too, think this is a great app!! Awesome free app! Loved the ideas mentioned in the blog for working on pre-writing skills. I’m thinking you could also use it as a motivator for young students who are working on learning correct letter formations. Instead of writing squiggles, they could write the letters they are working on. I did this with the car & rocket & it was really fun to watch the letters “take off”. What a great idea. I really like the Squiggles app and free makes it awesome! Thank you for your suggestions!